This photo of the historic Tampa Theatre located in downtown Tampa was taking during a warm summer day. Downtown Tampa is a fantastic area to photograph. Downtown Tampa boast the river, new high rises, historic buildings, art installations as well as night and weekend events. The Tampa Theatre and Office Building is a historic U.S.theater and city landmark in the Uptown District of downtown Tampa, Florida. On January 3, 1978, it was added to the U.S. National Register of Historic Places. 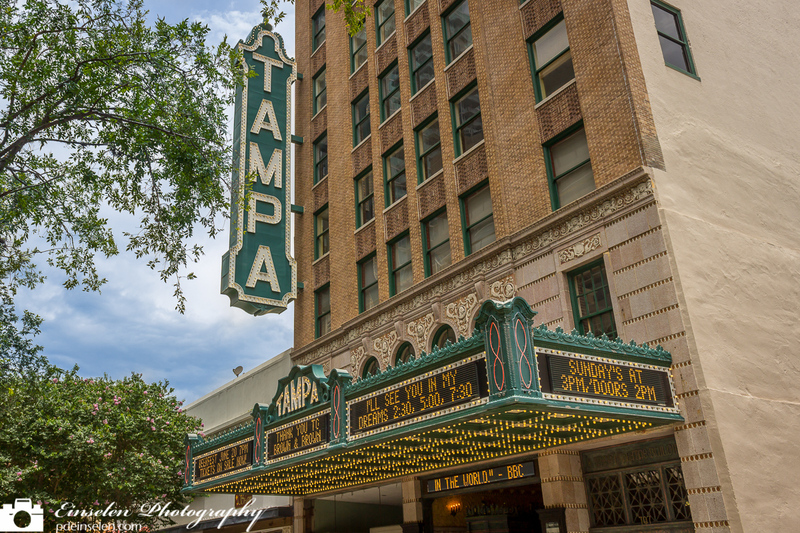 Designed as an atmospheric theatre style movie palace by architect John Eberson, the Tampa Theatre opened on October 15, 1926. The theatre was the first commercial building in Tampa to offer air conditioning, which gave the theater appeal during Florida’s sweltering summer months. Inside the Tampa, audiences are transported to a lavish, romantic Mediterranean courtyard replete with old world statuary, flowers, and gargoyles. Over it all is a nighttime sky with twinkling stars and floating clouds. Tampa Theatre operates The Mighty Wurlitzer Theatre Organ and the instrument is played before nightly films. The organ is played and maintained by a team of volunteer organists from the Central Florida Theatre Organ Society. In the spring of 2013, during its 86th year of existence, the Theatre converted to digital picture and sound (with the exception of productions that are only available in the movie reel format) and screened a free showing of Samsara to celebrate the transition. The switch to digital—in anticipation of an industry change whereby all new releases will only be available in digital format—occurred at a cost of US$150,000.